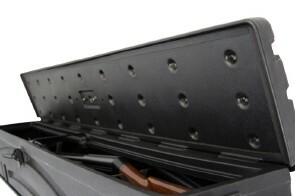 The DU-HA Humpstor is an all-in-one storage unit, tool box, and gun case that fits in the normally wasted space above the wheel well in full size pickup truck beds. 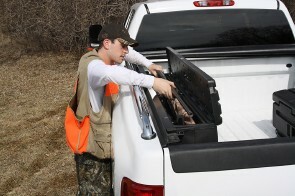 Innovative Truck Bed Storage / Tool Box / Gun Case. 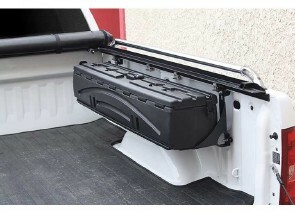 It gives you extra storage in your truck bed, while leaving the valuable bed floor space readily available. The Humpstor installs easily using included brackets that clamp to the lip of the bed rail. The brackets can be adjusted up or down to your height preference and to fit underneath tonneau covers and roll up covers. Holds 2 shotguns, or 1 rifle with scope in an upright position. Includes organizer /gun rack set. Lockable latches help protect your belongings from theft.